The table below lists the census metropolitan areas and agglomerations in Canada by population, using data from the Canada 2016 Census. Each entry is identified as a census metropolitan area (CMA) or a census agglomeration (CA) as defined by Statistics Canada. Any other census subdivision that comprises at least 10 per cent of the CMA or CA population is listed in parentheses. 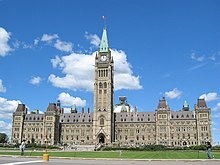 Note that a city's metropolitan area in colloquial or administrative terms may be different from its CMA as defined by Statistics Canada, resulting in differing populations. Such is the case with the Greater Toronto Area where its metro population is notably higher than its CMA population due to its inclusion of the neighbouring Oshawa CMA to the east and the Burlington portion of the neighbouring Hamilton CMA to the west. Between 2011 and 2016, the six fastest growing CMAs were located in Western Canada with Alberta's two CMAs, Calgary and Edmonton, leading the country. Saskatoon, Regina, and Lethbridge rounded out the top five in the country and each grew by at least 10%. Of the remaining 30 CMAs, all but two of them recorded population growth. Those that experienced population decline were Brantford and Saint John. Ten of the fifteen fastest growing CAs in Canada between the two most recent censuses were located in Alberta. The other five were located in British Columbia with two, and Manitoba, Ontario and Yukon each with one. Twenty-four CAs experienced population decline between 2006 and 2011. The fifteen CAs that experienced the greatest population decline were located in British Columbia (two), Manitoba (one), New Brunswick (one), Nova Scotia (three), Ontario (four) and Quebec (four). Okotoks experienced the greatest increase while Thompson experienced the greatest decline. Canada had 35 CMAs and 117 CAs as of the 2016 census. The number of CMAs increased from 33 in 2011 by promoting the Belleville and Lethbridge CAs. The number of CAs increased from 113 through the creation of eight new CAs – Arnprior, Carleton Place, Gander, Nelson, Sainte-Marie, Wasaga Beach, Weyburn and Winkler – the demotion of two CAs – Amos and Temiskaming Shores – and the promotion of Belleville and Lethbridge to CMAs. ^ "Population and dwelling counts, for census metropolitan areas and census agglomerations, 2016 and 2011 censuses (table). 2016 Census". Statistics Canada. Retrieved February 19, 2017. ^ "Population and dwelling counts, for Canada, census metropolitan areas, census agglomerations and census subdivisions (municipalities), 2011 and 2006 censuses. 2011 Census". Statistics Canada. January 15, 2012. Archived from the original on February 7, 2013. Retrieved February 8, 2012. ^ "What's the difference between the Greater Toronto Area (GTA) and CMA Toronto (census metropolitan area)?". Computing in the Humanities and Social Sciences University of Toronto. May 9, 2001. Archived from the original on April 9, 2010. Retrieved August 5, 2013. ^ a b "Population and dwelling counts, for census metropolitan areas and census agglomerations, 2011 and 2006 censuses (table). 2011 Census". Statistics Canada. Archived from the original on July 22, 2012. Retrieved February 8, 2012. ^ a b "The Canadian Population in 2011: Population Counts and Growth" (PDF) (PDF). Statistics Canada. February 2012. pp. 13–17. Archived (PDF) from the original on July 2, 2013. Retrieved October 12, 2014. ^ Canada, Government of Canada, Statistics. "The Daily — Population size and growth in Canada: Key results from the 2016 Census". www.statcan.gc.ca. Archived from the original on 10 February 2017. Retrieved 29 April 2018. ^ a b "Statistical Area Classification - Variant of SGC 2016 (Census metropolitan area and census agglomeration)". Statistics Canada. November 16, 2016. Archived from the original on November 16, 2016. Retrieved November 16, 2016. There are 35 CMAs and 117 CAs in 2016. Two new CMAs were created: Belleville (Ont.) and Lethbridge (Alta.). Eight new CAs were created: Gander (N.L. ), Sainte-Marie (Que. ), Arnprior (Ont. ), Carleton Place (Ont. ), Wasaga Beach (Ont. ), Winkler (Man. ), Weyburn (Sask.) and Nelson (Alta.). The CAs of Amos (Que.) and Temiskaming Shores (Ont.) were retired because the population of their cores dropped below 10,000 in 2011.